🔥 Hot-tip: Do you mess up git commit messages quite often? I DO! Most of the time I have to amend the last git commit message. So, I made a small bash function out of it. # Amend the last commit message. # Push the changes to remote by force. 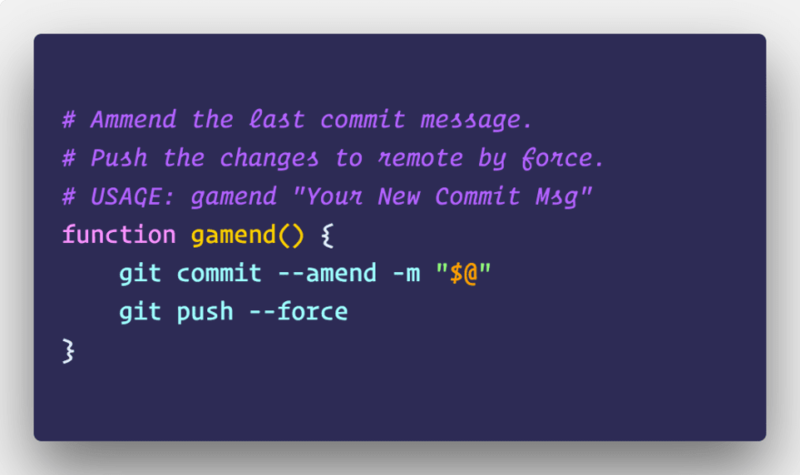 git commit --amend -m "$@"
⚠️ Avoid --force unless it is absolutely necessary and you can be sure that nobody else is syncing your project at the same time. ℹ️ Why git push --force-with-lease! If someone else pushed changes to the same branch, you probably want to avoid destroying those changes. The --force-with-lease option is the safest, because it will abort if there are any upstream changes. I amend my commits all the time too but I don't push my commits to remote after every commit. I push them only when I'm sure that I have done what's necessary and have no second thoughts (mostly at the end of my day or only twice a day). This way I mostly never have to force push as I only have to amend my local commit. Force push is a bad practice as it can mess up everyone's work if you're working in a big team. I would suggest to create two different gamend and gamendfp so you force push only when you have to and you're absolutely sure that you're not gonna break someone else's work. Hot-tip: Avoid --force unless it is absolutely necessary and you can be sure that nobody else is working on your project right now. Forgot to mention that — mostly I ask my team to resync after this. I think you can revert your commit with the wrong message. Now, cherry-pick your commit with the wrong message, amend it, replace with the right message and push without --force. You live with the wrong commit message for that commit. 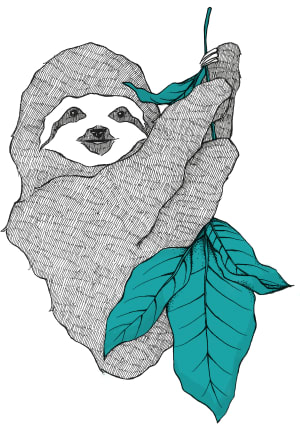 Unless you are the only one on that branch, NEVER(*) use force. History rewriting is bad, and you can make others lose their work. (*) For almost never values of never. The use cases are rare enough that it should never be scripted. You're right. After sharing this, what was meant to be a personal workflow, I ended up in long debates on Fb/Twitter about how this can be improved. But I am still not satisfied, so I am building a git hooks based workflow to make sure no bad git commit message gets committed in the first place.